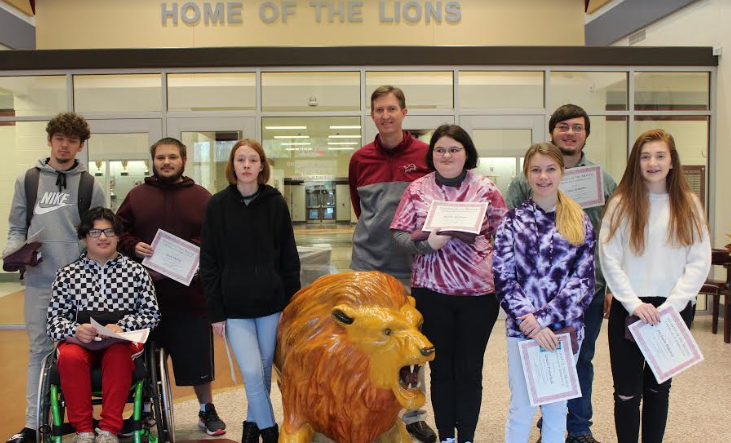 Pictured from left to right are Pictured from left to right are January Students of the Month Casey Richard, Angel Nunez, Jason Morris, Olivia Jennings, Principal Mr. Jared Griffis, Payton Waldron, Gracee Porterfield, Casey Sprankle, and Michaela Blakeney. Not pictured are Xavier Moreland, Robin Mya Smith, and Jacey Bradley. Central High School recognized January Students of the Month by awarding students tee shirts, certificates of achievement, food coupons, and athletic event admission tickets. Students are nominated by teachers for having good attendance, earning good grades, and for having good attitudes.